We haven't seen many -- okay, any -- Windows 7 slates from major manufactures (i.e. HP, Lenovo, ASUS) like Steve Ballmer promised back in July, but one thing is for certain, smaller companies aren't just sitting around waiting for the other shoe, er slates to drop. We've already gotten our hands on products from the likes of CTL and Netbook Navigator, but Australian-based Tegatech also wants a piece of the large touchscreen pie with its 10.1-inch Tega v2. Like the others, the $799 Tega v2 is pretty much a netbook that's lost its keyboard -- it's got an Intel Atom N455 processor, 2GB of RAM, and a 32GB SSD that boots Windows 7 Home Premium -- but the 0.5-inch / 1.9-pound slate sets itself apart by being one of the thinnest and lightest out there. 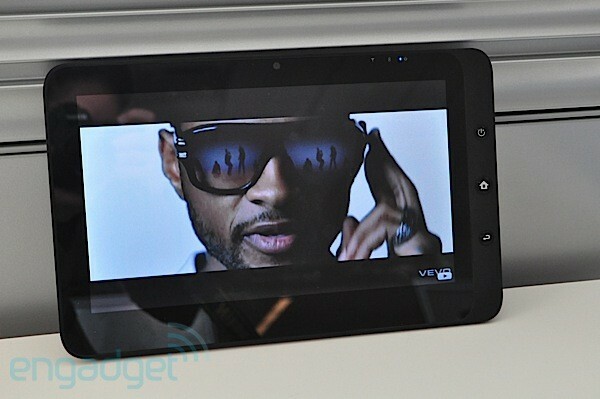 Oh, and did we mention that it dual boots Android? 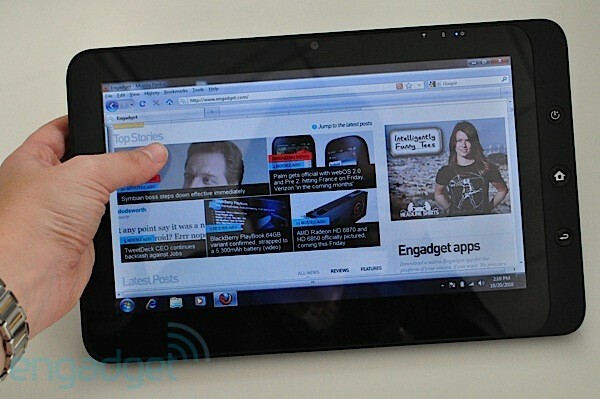 So, is the Tega v2 the Win 7 tablet you've been waiting for -- assuming you have in fact been waiting for one? Hit that read more button to find out in our full review! How would you rate the TEGA v2? When in its box (which happens to emit one of the best new gadget aromas we've encountered in awhile) the Tega v2's flush black bezel and glossy screen resemble most of the other tablets in the world, but once you hold it in your hands the differences are clear. The aluminum back makes it closer in feel to the iPad than any of the other plastic tablets (i.e. the Nav 9, Augen GenTouch, 2goPad, etc.) we've seen over the last couple of months. Its brushed metal edges and right bezel also give it some added firmness, although we're not sure why Tegatech skimped with the plastic buttons, which line the right edge. It would have been nice to see them made out of the same brushed black metal -- the ones on the Droid X come to mind. However, the real difference between the 9.5 x 7.5 x .5-inch Tega and the other Win 7 slates we've seen comes in thinness -- it's only 0.02-inches thicker than the iPad, and a noticeable 0.2-inches thinner than the 2goPad and the Nav9. That svelteness does make the 1.9-pound device easier to hold, but its 10.1-inch display is still used best when leaned on its included stand or propped up against a pillow or against your legs while laying down. Because the tablet is thinner than others, it doesn't have room for an Ethernet port, but it still makes room for two USB sockets, a microSD slot, a mini-VGA, as well as a combo headphone / mic jack. The top of the device houses a SIM card slot -- adding a 3G module costs $85, however. We should note here that if the Tega v2 is looking a bit familiar to you, Viewsonic happens to be using the same chassis for its ViewPad. The 1024x600-resolution, 10.1-inch screen is pretty much your typical netbook display, though its capacitive touchscreen causes it to be blanketed in way more fingerprints than your average ASUS Eee PC or HP Mini. Oh, and if Windex or Brasso Gadget Care polish isn't your thing, Tegatech actually sells its own LCD solution and shammy on its site. But we digress, and we know all you really care about is how the capacitive screen performs. Well, the good news is that there are no surprises there -- light taps on the display are all it takes to make selections and gentle swipes are enough to scroll down the page or browse through pictures. There's also a built-in accelerometer, which is quick to adjust the screen orientation, but like the CTL there's a quick flash of a black screen and at times it distorts the background a bit. In terms of actual quality of the display, the viewing angles aren't terrible. Slightly tilting the screen backwards when watching a YouTube clip caused some of the colors to distort, but we could still make out what we were looking at and sharing the screen with a friend didn't require us to readjust. The display was adequately bright for watching an episode of Mad Men on Amazon -- we just wish there was an easier way to adjust the brightness than having to dig deep into Win 7 menus. The 1.3 megapixel cam on the upper bezel allowed us to make a clear video call in Skype, but there's no preloaded webcam software for snapping stills or recording local video. We should also mention the small speaker grill on the back of the device produced some decently loud sound for a tablet, but wasn't quite as loud as the iPad when blasting out Usher's "OMG." Here's the part of the review where we repeat what we've said countless times -- Windows 7 is truly not a tablet operating system. Now, that doesn't mean there aren't minor optimizations that can be made to make it more finger friendly, and to that end, Tegatech has done a good a job as any at slightly tweaking the OS -- the font size defaults to medium and it's preloaded with the Thinix Touch software layer. The big-buttoned shortcut interface is a nice addition and makes it easier to select programs or websites, although we can't say adding new shortcuts is exactly the easiest task. (As far as software layers go, we're still looking forward to see how the ExoPC's compares to all of these subpar skins.) Still, we found it easier to select applications from the Thinix layer than having to navigate through the OS's tighter menus, but it can get extremely sluggish at times. As we said in the 2goPad review, we do wish there were more touch-friendly programs loaded or even some sort of Win 7 touch app store, but we assume that the companies that ultimately pick up these tablets up will load their own proprietary software. As you will see in the video below, we've actually gotten quite adept at navigating Windows with a finger, but there have just been countless times where we just wished navigating could be easier and we wouldn't have to worry about mistakenly selecting things. While the capacitive screen does make it easier to get around with a finger and type on the on-screen keyboard, we do wish these tablets would have an active digitizer, which would allow for better stylus input and handwriting recognition. Tegatech has customized the buttons on the right edge to make some tasks easier. Holding down the Home button for a second brings up the desktop and then holding it down for about five seconds displays all your open windows. But there's more -- holding it down for ten seconds doubles as your Ctrl + Alt + Delete key, which we have to say came in handy a few times when Firefox stalled the entire system. Those button commands all make sense to us, but why the back button was ever configured to automatically turn on / off WiFi will remain a mystery to us -- we consistently hit it a few times thinking it would bring us back to a page and ended up killing our WiFi signal. Unfortunately, there's no way to reassign the button shortcuts. Wait, you've completely forgotten about the fact that Tega v2 dual boots Android 1.6! Why yes, we did, and so will you, well... at least until Tegatech makes some serious updates. There are currently issues with the WiFi driver, which means you cannot get online in the Google OS. We'll update this review when Tegatech releases the WiFi drivers as well as Android 2.2. But yes, for now the Android really serves no purpose. We should also note, that while our unit came with Android preloaded, the company won't preload it and will only offer the .iso on its site for download. 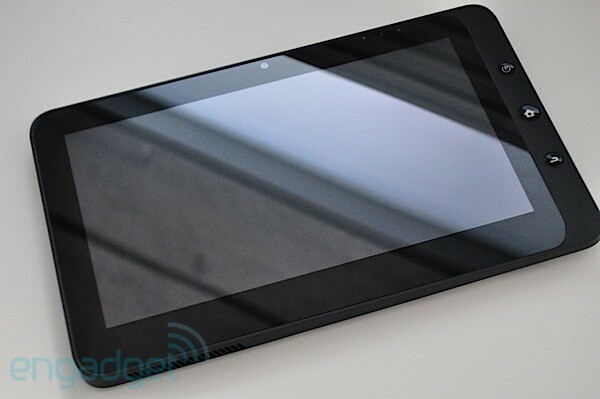 As opposed to the CTL 2goPad or Nav 9, the Tega v2 is powered by Intel's Atom N455 processor, which supports DDR3 RAM. However, we can't really say that we saw a difference in how the 2GB of improved memory pushed along Windows 7 Professional. 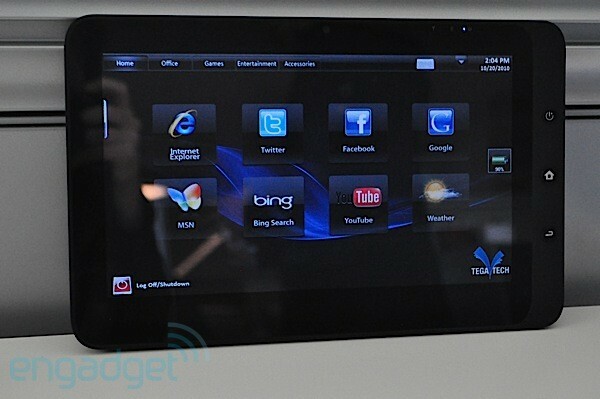 (Note: the $799 version will come with Win 7 Home.) In terms of overall performance, running Windows Media Player, TweetDeck and a number of tabs open in Firefox was just peachy, but there were times where the system would randomly hang up. And as we mentioned above the Thinix software layer was extremely sluggish at times. There's also no change in how it handles video -- local and streaming standard definition video was no issue at full screen, but upping it to 720p caused it to get all sorts of nervous and start stuttering. Despite having a fanless 32GB SSD, we noticed the system's fan running in the background quite a bit, though it did keep the entire chassis relatively cooled down. Additionally, there was a periodic purring noise that came out of the left side of the chassis. We told you the battery section of these reviews were going to sound like a terrible song stuck on repeat, and like the others, the Tega v2 doesn't last for longer than 3.5 hours on a charge. On our video rundown test, which loops the same standard definition video at 65 brightness with WiFi on, the integrated battery lasted three hours and 7 minutes. That is better than the other Atom-powered tablets we've reviewed, and when we used it to just surf the web and mess around in Paint it lasted close to four hours. Either way, since the Tega v2's battery cannot be replaced, you're best keeping the AC adapter with you at all times, which may be why the company included a car charger in our box. Yet again, we're torn on another Windows 7 slate. At the end of the day, the Tega v2 is a decent tablet in terms of hardware, though for $799 it's more expensive than the $499 2goPad. That extra cash does happen to buy you a thinner and better feeling product with an SSD and Android, but even when you put the money aside, it still doesn't change the fact that we're just having a hard time suggesting you get any of these tablets at the moment -- the Windows touch layers aren't all that compelling and the battery life, well... it's borderline tragic. We'll continue to kneel by our bed at night and pray that better hardware and software improvements arrive soon, but until someone listens to us, the Tega v2 is another as-good-as-it-is-gonna-get Windows 7 slate.